How much faster is the Note II than the very first Intel Pentium chip? The power behind the Samsung GALAXY Note II is phenomenal when compared to handsets of today, but if you do a little bit of backwards-gazing it's stunning to see how far computing has come in a mere 20 years. Why 20 years? Well, it was in 1993 that the Pentium processor was born – the first chip that, arguably, made non-geeks interested in computing technology. Going back even further, though, Intel actually first created chip history over 40 years ago, with the arrival of the first ever single processor. Yes, we all love to shout (quite rightly) about the quad-core processor which powers the GALAXY Note II, but let's not forget that it was the humble Intel 4004 that kick-started this evolution – placing all the bits that made a computer, well, compute on to a single piece of silicone. Skip 20 years and Intel offered up the idea that having Intel Inside your devices was a good thing. Before it created the Pentium brand, no one except die-hard enthusiasts knew about the chips that powered their computers, but Intel managed to make processors, dare we say it, cool. The first Pentium chip, the P5 – it was given the name Pentium as it was the fifth generation of processor, with "pente" being the Greek word for five – was available in a whopping 60MHz or 66MHz and had 3.1 million transistors powering the thing. Compare this to the Note II's chipset, which runs at 1.4GHz, and you can start to see how far we have come. Given that Moore's Law predicts that computer processors double every two years, by 1998 Pentium were now clocking a (at the time) whopping 450MHz. Intel began offering a cheaper version of the chip, the Celeron, and a higher-end version, the Xeon. The advent of low-powered chips meant that smaller devices such as phones could begin to have features that were computer-like, such as powering the many apps – essentially mini computer programmes – that can be found on the GALAXY Note II. Alongside Intel's push for computing power, British company ARM was creating its own architecture for mobile chips. 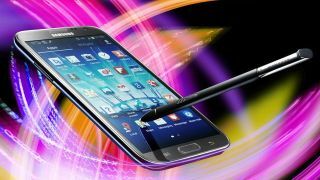 Now in 95 per cent of all mobile phones, Arm architecture can be found in many a device – it's in the Note II for starters – with the technology used by the major semi-conductor makers Samsung, Qualcomm and nVidia. Why ARM? Well, it's low-powered, uses fewer transistors and generally turns the latest portable devices into a computational whiz kid. Taking Intel's original idea of putting all of the computers thinking processes on to one chip, this eventually advanced to what we know today as a System on Chip (SoC) processor. And it is a quad-core variant of this chip that makes the GALAXY Note II tick. All System on Chip (SoC) means is that the chip has all the components it needs on a single chip to control and power a device. To put it into context: one of these chips has the same computing power as an entire desktop computer from a decade ago. And that is what is powering the Note II – it's a mini computer in your pocket, complete with all of that S Pen loveliness. And this leads us to the Note II. Just how much power is packed into the device? Well, if you compare the processor to what was around 20 years ago, the results will astound. If you just compare Hz (how many cycles a second a processor responds), then the P5's 60Mhz is some 25 times less powerful than the GALAXY Note II's 1.6GHz processor of today. But this doesn't take into account that the processor is quad-core so theoretically the Note II has a processor around 100 times more powerful than what was around just 20 years ago.